Petter, Stacie: Managing user expectations on software projects – Lessons from the trenches; in: International Journal of Project Mangement, in press (2008). 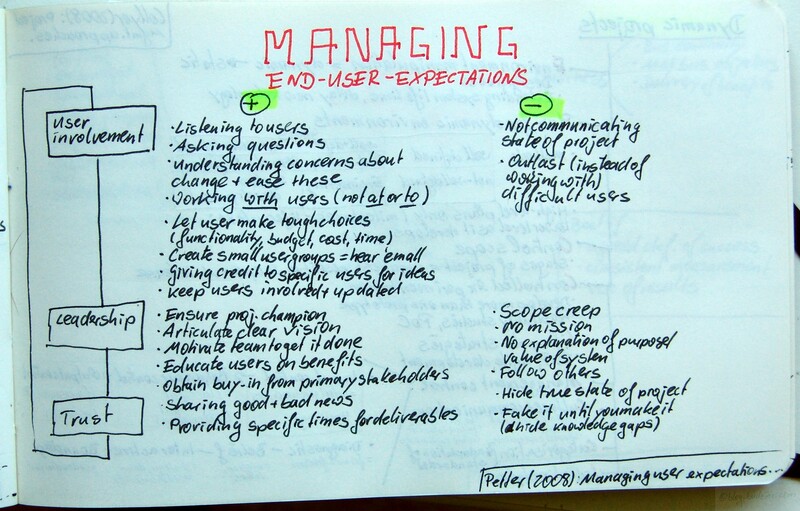 Petter interviewed 12 project management professionals on managing the end-user expectations. What worked and what did not work? What did not work were – not communicating the project status, and trying to outlast difficult users. Trust building activities that worked well, were sharing good and bad news, and providing specific times for deliverables. What did not work were hiding the true status of the project, and ‚fake it until you make it‘ also known as hiding knowledge gaps.